Last night I went to a neopagan ritual locally in Oakland. For the non-pagans out there who somehow missed out on Halloween symbolism (or who aren’t Americans), Halloween commonly has associations with the dead, largely through Catholicism. The neopagans, of a general sort as well as the Celtic types, associate Samhain, October 31 these days, with the Dead, and consider it the time to honor the dead and when the “veil between the worlds” (of the living and dead) is the thinnest. Here in California, we also have Día de los Muertos, the Day of the Dead, celebrated on All Saints Day, November 1, which is drawn from Mexican traditions (we have a lot of Hispanic folks, dontchaknow). 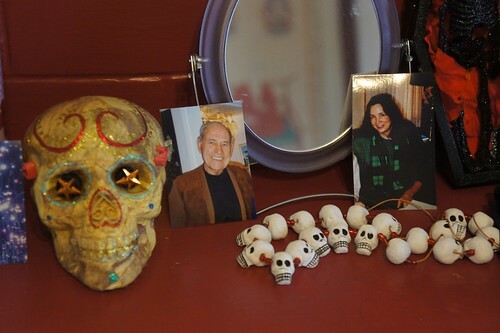 In my house, we put up a Day of the Dead altar every year. We’ve been doing this since we lived in Seattle. On it, we put our dead friends and family, those lost to us over the years, and, strangely, the altar only grows over time as we age. This year, we added my wife’s father and her aunt, both lost to us by illness. Presented by the Coru Cathubodua, a priesthood dedicated to the Morrigan. Come join us at the turning of the year to celebrate the great Celtic feast of Samhain! Share a Celtic-style feast of ancient foods as we dine with the Otherworldly host. Raise a glass in honor of your Ancestors, Gods and those who are to come after us. Join in the tale as the myths of the mighty heroes of old are brought to life to inspire our lives. Lend your spirit as we renew the Sovereignty of the land at the turning of the year. An ancient period-style Celtic feast will be laid out in three courses, providing the structure for the evening’s ritual. We have selected recipes for the feast that closely match the kinds of foods our ancestors would have eaten, relying as much as possible on fresh, local and seasonal ingredients, with an eye to what would have been available to the ancients. The Samhain ritual will be enacted in three parts: the first dedicated to the Ancestors, the second to the Gods and the Fey, and the third dedicated to the Descendents, those who will come after us. We will open the Otherworld gateway and invite the Mighty Ones to join us in feast and celebration as we enact the ancient stories of their heroic deeds: Brave warriors who ventured out to meet the host of the Sidhe on the haunted eve of Samhain. The Morrigan’s gift of prophecy and blessing for the mighty Dagda, on the eve of Samhain, when the Tuatha De Danaan prepared to fight for the sovereignty of Ireland. And the untold story of our own generation’s heroes, and those to come after us. 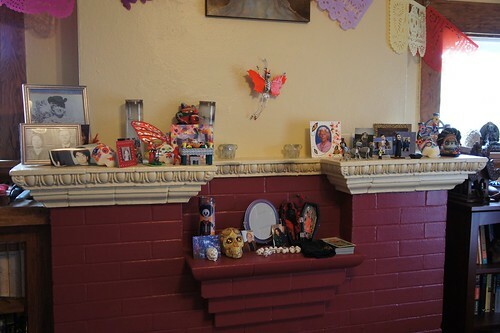 An altar will be set up where you are welcome to place pictures and mementos of your own Ancestors and beloved Dead, and places will be set at the tables where we may feed them. We attended and it was… interesting. Rebecca added to the altar when we arrived. I found the ritual activities moving but also very familiar. I spent a lot of time at various points over the years in the kind of social and ritual environment in which this ritual took place. The delineating of sacred space, the calling of the ancestors, the reciting of old tales, and the seeking of light from the dead, ritually, as well as the act of eating and drinking with and in remembrance of the dead were all familiar and moving as well. This is the kind of ritual that I don’t see within the Buddhist communities I function within. While most of my Buddhist activities are done as a solitary, without a local community but a more distributed one, even those that do have a local community really don’t seem to do things of this sort. This aspect of community and celebratory religion really is missing from most forms of Western Buddhism, whether Zen or otherwise. It does bring home elements of what I lost when I explicitly turned my back on sixteen or so years of being a Neopagan. Once upon a time, I helped lead a kindred that did exactl this sort of ritual, though in a more Germanic vein. It does tend to seem very familiar (moreso than the Catholicism of my youth, even). That said, I’m as theistically challenged as ever so I’m probably not going to become a Morrigan worshipper. It was a good way to remember our dead and the fact that they are never really gone from us, even though they are no longer with us in other ways.